John Michael was 38 years old and living with his younger second wife, Catherine. His first wife, Christina Elisabeth Schemmel, passed away on July 30, 1849 and he was married later that year to Maria Catherine Wellerding. 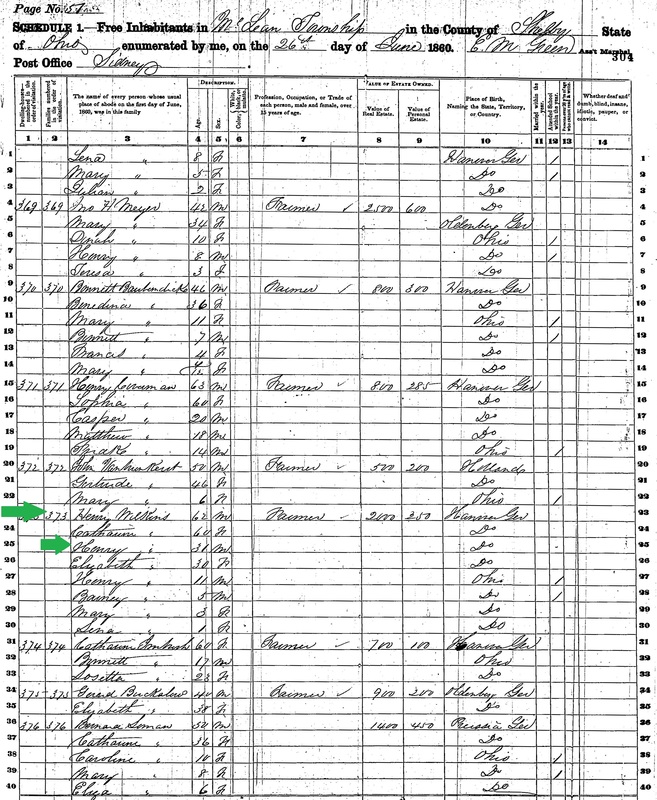 The five children listed on this census form are Christina Elisabeth's children. My husband's great-great grandfather, J.M. "Mike" Drees was not born until 1851. Also living with John Michael is his younger brother, Henry, also a blacksmith, who later goes on to become a Catholic priest (and actually the head of his order in the United States - good topic for another blog post). The 44-year old woman, 'Agnes Swelerding,' is likely Catherine's mother. Biography of Johann (John) Michael Drees, The History of Western Ohio and Auglaize County, pages 838-839. Here is a photo of John Michael Drees that was published in Pilgrims All: A History of St. Augustine Parish, Minster, Ohio, 1832-1982. Personally, I see a pretty good resemblance between John Michael and my father-in-law (his great-great-grandson), especially considering there are four generations separating them. Over the past couple of weeks, I have had the opportunity to do something I have not done in awhile: research a branch of my husband's family tree almost from scratch. 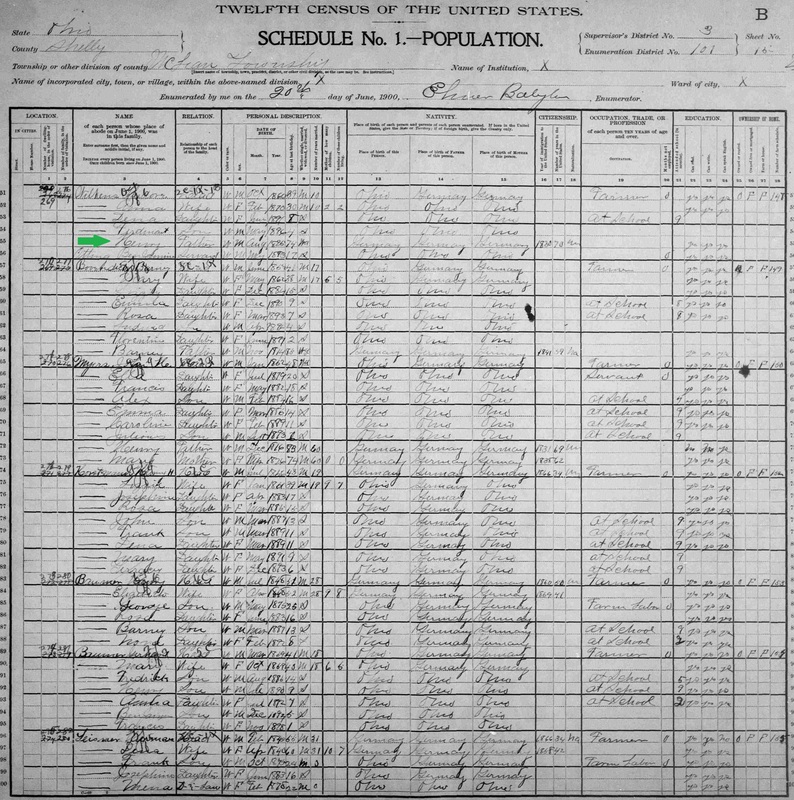 I have been able to trace most of my husband's branches back to the point at which they came to America in the 19th century - some lines even further back, but until recently, I had not earnestly tried researching the family of my husband's great-great-grandmother, Mary Wilkens Drees (1857-1942). Why didn't I? Part of the reason lies in the fact that she married into the Drees family - a large, influential family in the area - so I had always been preoccupied with collecting information and documents pertaining to THAT branch of the family, and she sort of got placed on the back burner. Another reason is because, when I did try to dig further back in time, I now know that I was going off of false parentage information that was listed in her obituary and on her death certificate, so even when I did a quick search, nothing relevant seemed to come up. For awhile now, I've had Mary's obituary and death certificate. She married J.M. "Mike" Drees sometime around 1880-1881, after Mike's first wife passed away. In her obituary, her parents are listed as 'Theodore Wilkens' and 'Mary Fortman,' and in her death certificate, they are 'Theodore Wilkens' and 'Catherine Fortman.' 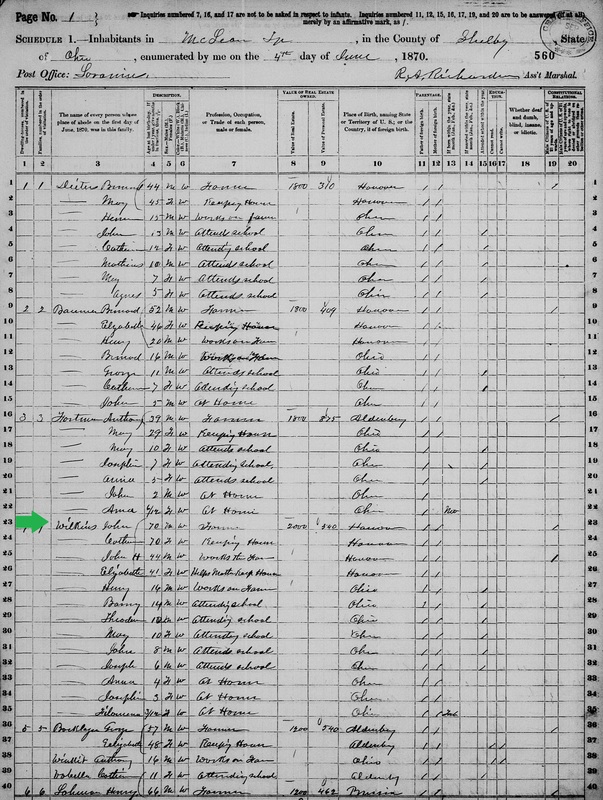 While searching through documents, I found that there was no Theodore Wilkens anywhere in the area old enough to be her father, BUT in the 1880 Census, I do find a Theodore Wilkens living with his parents, J.H. and Elizabeth Wilkens AND a sibling named Mary Wilkens. The family lives just over the county line, very close to where her future husband is living. Mary's age is a couple of years off from the 1857 birth date listed on her death certificate, but this is as good of a lead as I've had, so I just go with it. Along with Theodore and Mary, there are six other children in the household, so I begin to research these siblings of Mary Wilkens. Almost right away, I find Theodore's death certificate on FamilySearch.org and his obituary in The Minster Post newspaper archives, both of which list his parents as Henry Wilkens and Elizabeth Fortman. I use these websites to look up the same documents for a couple other of Mary's siblings. The parents' names agree with those of Theodore, AND Mary is actually listed as a sibling in a couple of the obits. Now, I know I have the right family in the 1880 census. Not only does this obituary list John Henry's children, but it also lists his age at death, where he was born in Germany (Twistringen, Hanover), his year of marriage, the year of his wife's death, where he lived prior to Shelby County, Ohio, and that his parents also made the trip over from Germany. 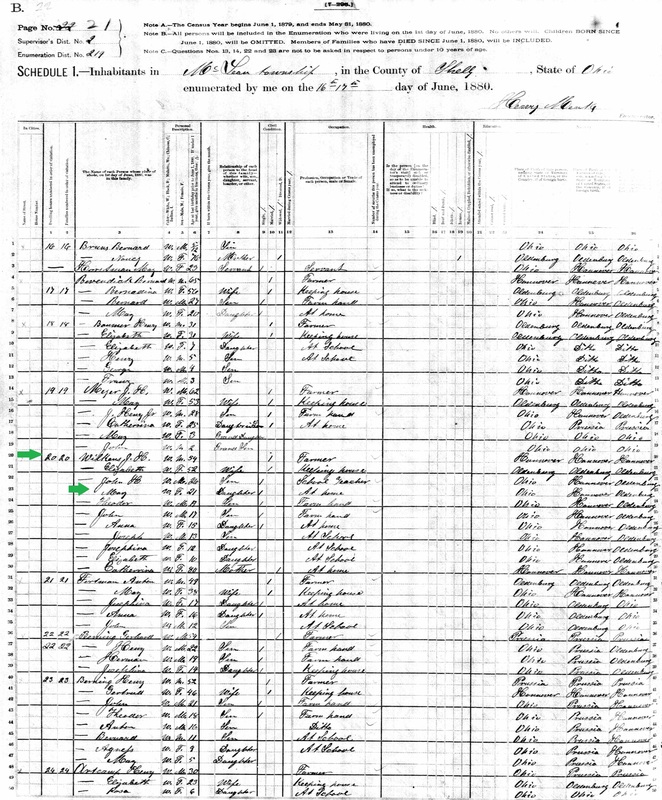 In the 1900 U.S. Census, John Henry is living with his son, Theodore. That census form states that he immigrated to America around 1830, so I know he has spent most of his life in America. 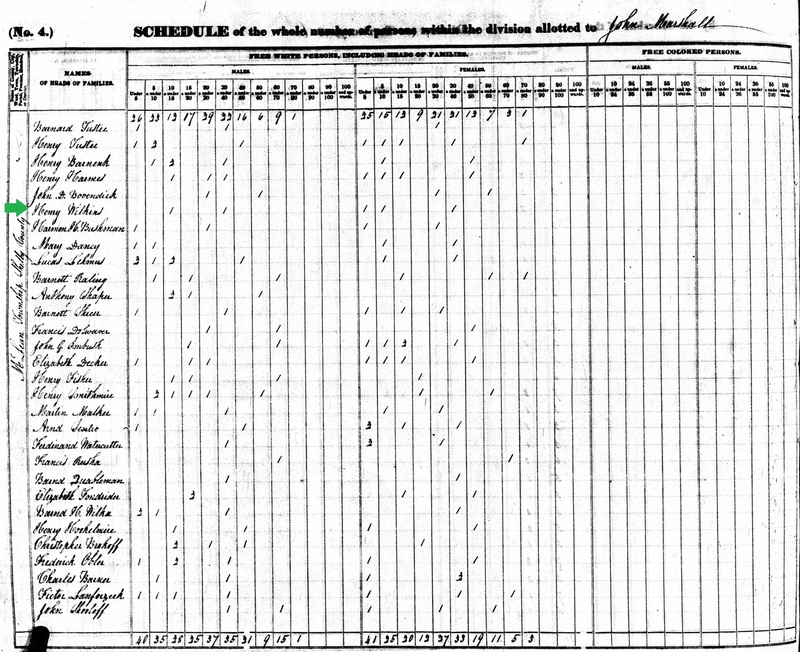 I then am able to find him, his wife, Elizabeth, and their children in the 1860 and 1870 census forms, living with John Henry's parents, John Henry and Catherine Wilkens. Quite serendipitous, really, and it helped that the family stayed in the same county and township for so many decades. 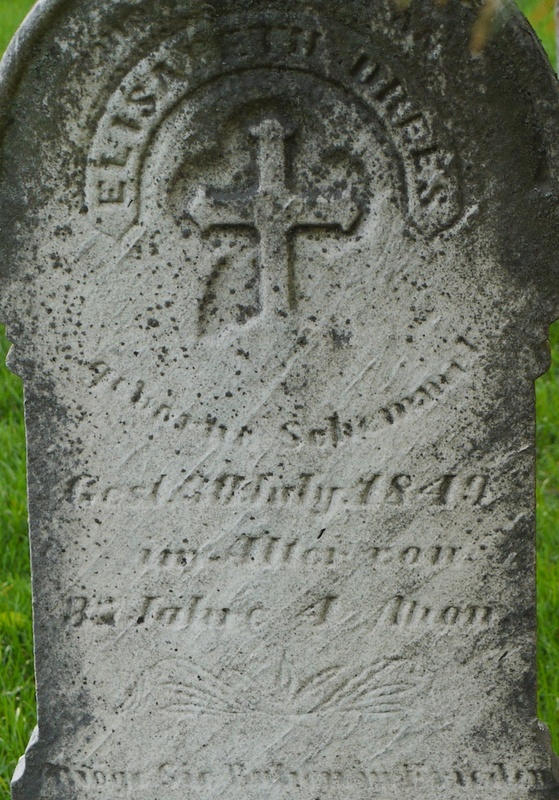 It appears that the elder John Henry passed away sometime between 1870 and 1880, because Catherine is listed as a widow living with her son and grandchildren in the 1880 census. "John Henry Wilkins of the county aforesaid makes solemn oath that he made his declaration of intention to become a citizen of the United States seven years ago, in the Court of Common Pleas of Miami County Ohio, that he received at that time a certificate of the clerk of said court of that fact: But that six years ago last spring his house was consumed by fire, and said certificate was consumed in it." So, the fire would have occurred around 1838, probably in Miami County, Ohio, which is one county south of Shelby County. By the 1840 Census, he is living in Shelby County. Would he ever have picked up and moved to Shelby County if not for the fire? I'll probably never know for sure, but it has really made me think about how a family's future (and not just the immediate future, I'm talking generations down the line, as well) can be changed by events such as these.